WASHINGTON — The U.S military launched weekend airstrikes targeting and likely killing an al-Qaida-linked militant leader in eastern Libya who has been charged with leading the attack on a gas plant in Algeria in 2013 that killed at least 35 hostages, including three Americans. The Libyan government said warplanes targeted and killed Mokhtar Belmokhtar and several others in eastern Libya. A U.S. official said two F-15 fighter jets launched multiple 500-pound bombs in the attack. The official was not authorized to discuss the details of the attack publicly so spoke on condition of anonymity. U.S. officials said they are still assessing the results of the Saturday strike, but Pentagon spokesman Col. Steve Warren said the military believes the strike was successful and hit the target. Neither U.S. officials nor the Libyan government provided proof of Belmokhtar’s death, which likely requires a DNA test or an announcement by Belmokhtar’s group that he was killed. Officials said there were no U.S. personnel on the ground for the assault. The U.S. filed terrorism charges in 2013 against Belmokhtar in connection with the Algeria attack. Officials have said they believe he remained a threat to U.S. and Western interests. Belmokhtar, an Algerian in his 40s, had just split off from al-Qaida in the Islamic Maghreb, or AQIM, to start his own franchise. 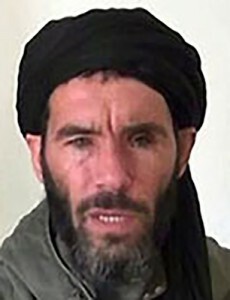 Belmokhtar has a long history of leading terrorist activities as a member of AQIM, is the operational leader of the al Qaida-associated Al Murabitun organization in Northwest Africa, and maintains his personal allegiance to al-Qaida, Warren said. The Libyan government in a statement Sunday said that the strike targeting BelMokhtar came after consultation with the U.S. so that America could take action against a terror leader there. One government official in Libya said an airstrike in the northeastern coastal city of Ajdabiya hit a group of Islamic militants also believed linked to al-Qaida and that it killed five and injured more. He said the group that was injured got into clashes with the Libyan military that guarded the hospital there, leading to hours of fighting. He spoke on condition of anonymity because he was not authorized to speak to reporters. The official couldn’t confirm that was the same strike that killed Belmokhtar. The charges filed against Belmokhtar by federal law enforcement officials in Manhattan included conspiring to support al-Qaida and use of a weapon of mass destruction. Additional charges of conspiring to take hostages and discharging a firearm in furtherance of a crime of violence carry a maximum penalty of death. Authorities also offered a $5 million reward for information leading to the arrest of Belmokhtar, who’s also been known as “the one-eyed sheik” since he lost an eye in combat. The airstrike comes as al-Qaida militants in eastern Libya continue to battle with members of the Islamic State, as the warring groups fight over power and resources. And the U.S. has been involved before in the fight against extremists in Libya. U.S. special forces in 2013 went into the Libyan capital Tripoli and seized Abu Anas al-Libi, whisking him out of the country. Al-Libi was accused by the U.S. of involvement in the 1998 bombings of two American embassies in Africa. He has been on the FBI’s most wanted terrorists list since it was introduced shortly after the Sept. 11, 2001 attacks. There was a $5 million bounty on his head. Al-Libi died January this year in a US hospital from a long-standing medical condition. On Sept. 11, 2012, an attack on the U.S. mission in Benghazi, Libya, killed Ambassador Chris Stevens and three other Americans. Other al-Qaida linked militants are believed behind that attack. Last week, a senior al-Qaida leader was killed by masked gunman, prompting the group to declare holy war on the local Islamic State affiliate. Clashes between the two groups in the eastern coastal city of Darna killed 11 people. Libya has been divided between an Islamist-led government backed by militias that seized the capital of Tripoli last August and its elected parliament, which now must convene in the far east of the country. Militants have taken advantage of the chaos, flowing fighters into the country’s vast ungoverned spaces. And as the Islamic State has grown in power, fueled by successes in Iraq and Syria, some al-Qaida fighters have switched loyalties. In its statement Sunday, the Libyan government said that the operation “is a piece of the international support that it has long requested to fight terrorism that represents a dangerous threat to the regional and international situation.” It added that the government would like more help fighting terrorism, including the Islamic State which controls Sirte and is moving west toward Misrata and south toward the Jufra military base. Associated Press writer Sarah El Deeb reported from Cairo.